Part of Route 24 in Brockton was shut down after a crash caused a tractor-trailer and a pickup truck to overturn. 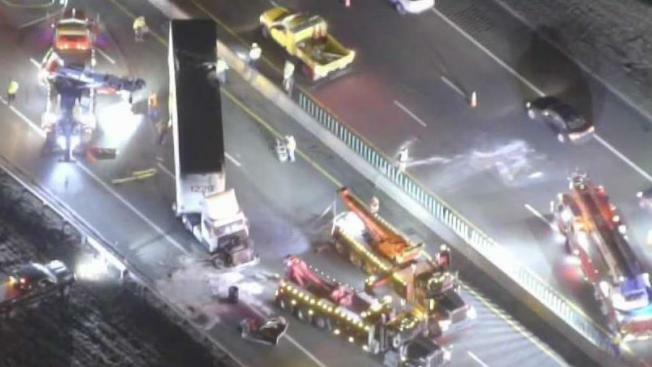 A tractor-trailer and a pickup truck rolled over after a crash Friday night on Route 24 in Brockton, Massachusetts, and people are being asked to avoid the area. State police said traffic was being diverted off Route 24 at exit 18 after a multi-vehicle crash caused a tractor-trailer to roll over on the northbound side of the road and a pickup to roll over on the southbound side. Police said minor injuries were reported. Jacquelyn Goddard, communications director for the Massachusetts Department of Transportation, said Route 24 northbound was closed to traffic, while one lane was open southbound. The Brockton Fire Department later said the highway was completely closed. NBC10 Boston's SkyRanger was over the scene, where northbound traffic was backed up significantly. The back of the tractor-trailer was marked "U.S. MAIL." A multi-vehicle crash caused a tractor-trailer to roll over on one side of Route 24 while a pickup truck was flipped on the other side.